A report released Friday found that 14,000 kids in Arizona lost their insurance when the state canceled its health insurance program for low-income children at the beginning of 2014. Arizona is the only state without a Children’s Health Insurance Program (CHIP); the programs provide insurance to low-income children whose families earn too much to qualify for Medicaid. The report from Georgetown University’s Center for Children and Families examines what happened when the state froze, redesigned and ultimately ended the program Jan. 31. 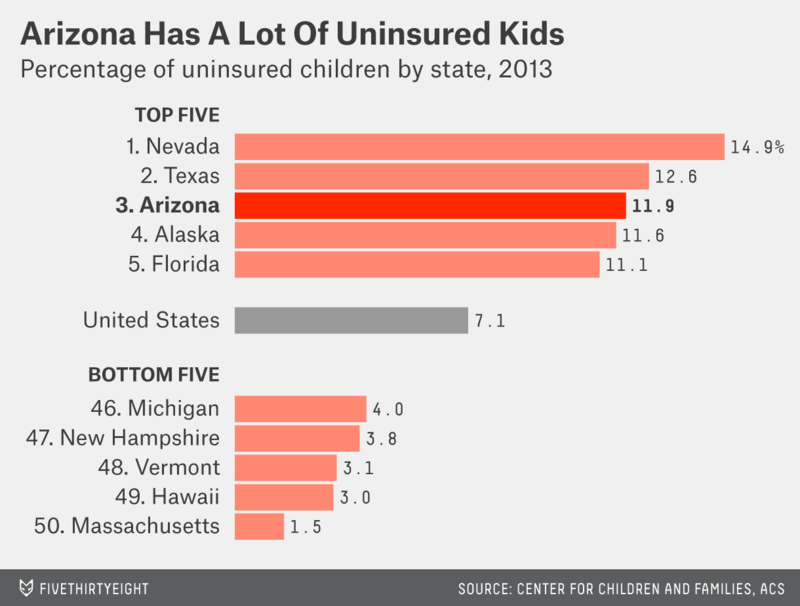 As of 2013, Arizona had the third-highest percentage of children without insurance in the country, behind only Nevada and Texas and well above the national average. How did this happen? At the end of the recession, Arizona froze the state’s CHIP program, citing budget constraints (though it was the only state to do so). The 46,000 kids enrolled at the time were able to keep their insurance, but no new enrollees were accepted. By July 2011, the waiting list had grown to 100,000, according to the report. The federal government negotiated with the state to reopen a short-term, alternative program that would be in place from November 2012 until Jan. 31, 2014. After that, provisions of the Affordable Care Act (ACA), often referred to as Obamacare, were supposed to go into effect. The catch is that the ACA would take over for only some of those kids. Under the ACA, states that expand Medicaid extend the program to everyone earning less than 138 percent of the federal poverty line. CHIP, on the other hand, covers kids up to 200 percent. After CHIP was canceled, the only option for kids whose families earned too much to qualify for Medicaid was to purchase insurance on the state’s health exchanges. It’s not yet clear what percentage of those 14,000 kids gained insurance that way. But the report notes that they may be particularly susceptible to what’s called the “family glitch” in the ACA. Families are eligible for subsidies on the health care exchanges only if they don’t have an “affordable” option from an employer. In the eyes of the federal government, an employer-sponsored plan is affordable if the cost for covering the employee is less than 9.5 percent of his annual income. Although covering multiple family members is usually much more expensive than covering an individual, the family would still not be eligible for subsidies if the plan is affordable for the individual employee. 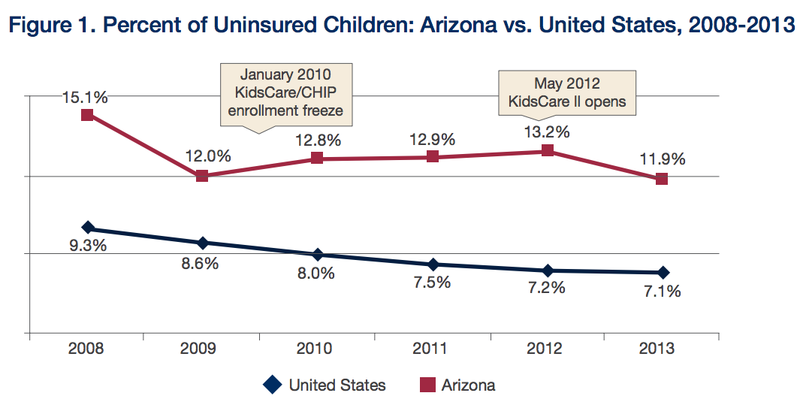 Looking at the fluctuation in the percentage of uninsured children as CHIP came and went in Arizona gives a sense of how important the program was for insuring children (though purchasing insurance on the exchanges, now possible during open enrollment periods, wasn’t an option during that time). While the uninsured rate decreased from 2008 to 2013, it actually increased from 2009 to 2012.